A year ago, I submitted my idea for soaker hose repair to Garden Gate magazine. Imagine my surprise when I opened the October 2015 issue and saw my "Soaker hose solution" right there on page 5! The magazine did not have enough room to include a couple photos I sent with the submission, but I included them below. Incidentally, as a 20-year subscriber to the (advertising-free) Garden Gate magazine, I can whole-heartily recommend this publication to anyone who enjoys gardening and landscaping. 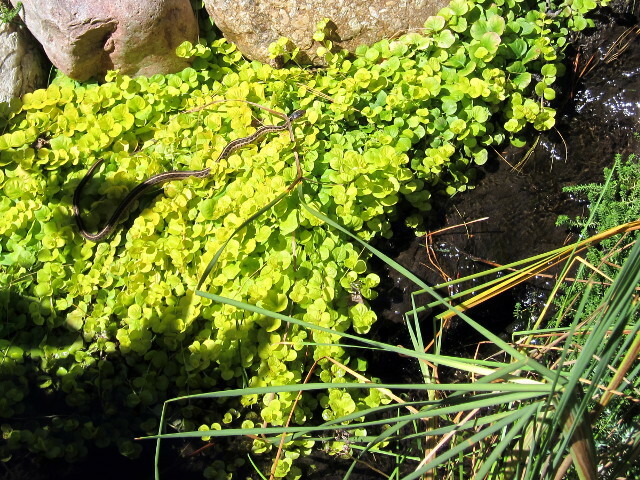 It has certainly played a supporting role in the development of our backyard landscape! I've never had much luck using those garden hose repair kits on underground soaker hose. 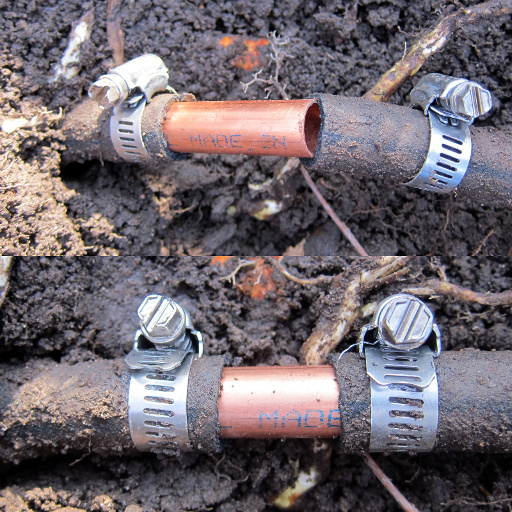 The plastic pipe that reconnects the hose is not always long enough, is difficult to insert, and the plastic clamps are not sized correctly for the thicker soaker hose. So a couple years ago, after yet another shovel mishap, I tried a new approach using a piece of copper pipe and 2 hose clamps. After using this method a few times, it has proven to be a quick, easy, and durable solution. The most difficult part now is finding the underground hose! 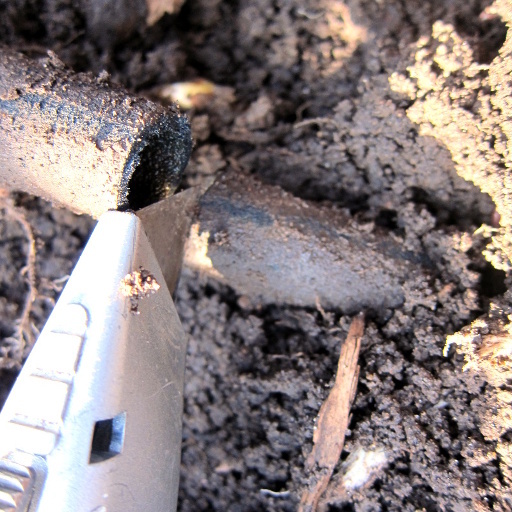 First, cut away at least 1 inch of rubber from the damaged soaker hose to make some room to work. 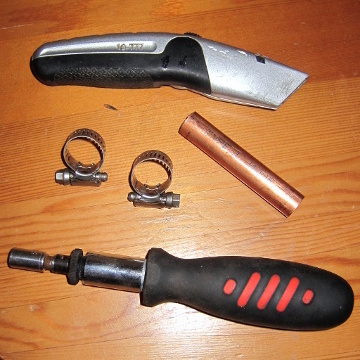 Next, cut a length of 1/2 inch copper type 'L' pipe (or PVC) that's a couple inches longer than the gap to be repaired. Smear a little petroleum jelly or liquid soap on the pipe. Insert one end of the pipe halfway into the hose (if necessary, tap it gently with a hammer). Put 2 stainless steel hose clamps (sized SAE 10 or SAE 12) on the hose ends and tighten the first clamp over the hose to the pipe. Line up the other end of the pipe and gently push down at an angle to slide it into the hose. Tighten the other clamp and you're done! After a snowy and cold Winter reminiscent of my days growing up near Buffalo, New York, it was especially nice to see everything turn from white to green this Spring. 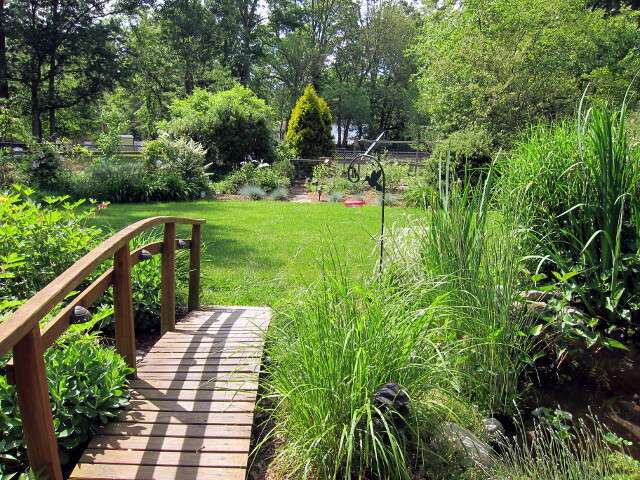 This, and the next photo, were taken in late May, and I really like the small Elijah Blue Fescue grasses on the boarder. Unfortunately, the hot Summer sun beat down on the 3 rightmost plants so I'm not sure they'll grow back this year. As you can see above, we already have our hummingbird feeder hanging at the right end of the bridge. Our hummingbirds are very territorial and are always chasing each other around and away from this feeder. So this coming year, we're going to try hanging a second feeder in the yard to see if we can host more of these amazing birds! 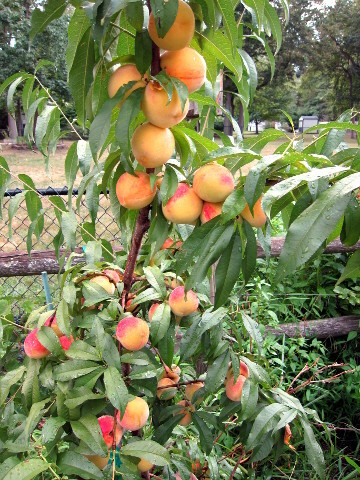 When we planted our peach tree in October 2012, we never imagined that in less than 3 years, we would have so many peaches! Besides eating them, we gave them away to friends, neighbors and family. They were a little small, so maybe I should have pruned some of the buds early in the season, but they were absolutely delicious! 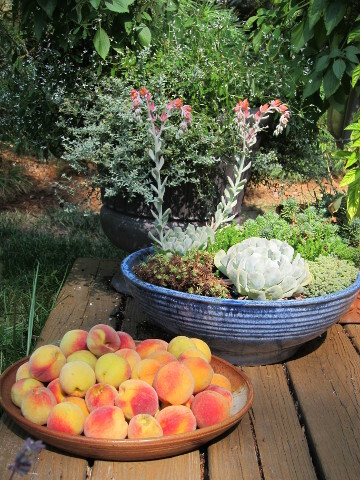 That blue container behind the plate of peaches is a collection of succulents that Catarina put together in the Spring. The pot and its contents are now overwintering in the garage, but will reappear on our back porch in a couple months. Can you find the Eastern Ribbon Snake in this photo? We hadn't seen a snake all year, but in early Fall, they started slithering by for a dip and a snack. I suspect they eat the minnows and maybe the crickets, but our frogs are too big. Incidentally, we had no less than 6 frogs that made the pond their home this year, which also made for some rather noisy evenings! Alas, I have no photos of them. And I also just realized I have no photos of the honeybees either, but I'm happy to report that we harvested nearly 4 gallons of delicious honey this year! 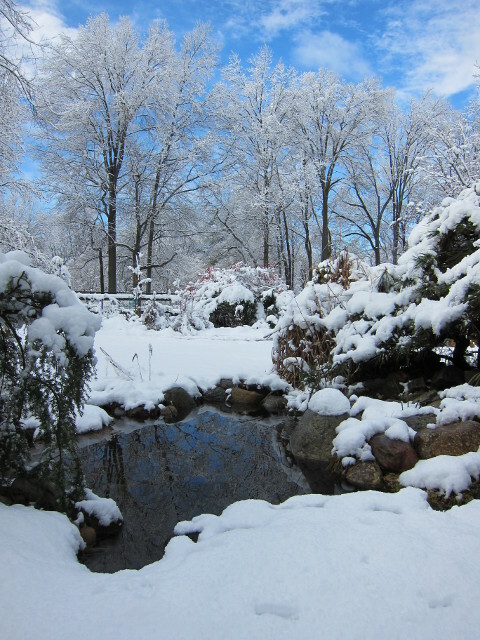 Even if you do not like snow, you must admit that it can make for some beautiful photographs! Especially right after a storm, when all the branches are still coated in white and set against a blue sky. 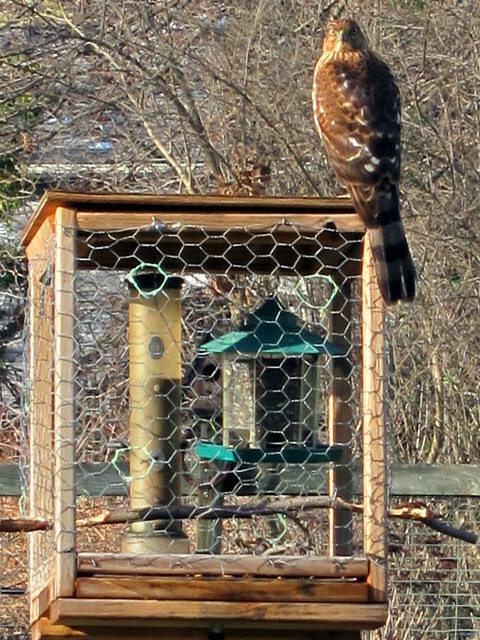 We only had one bird at the feeder on this January afternoon, a Red-Shouldered Hawk. 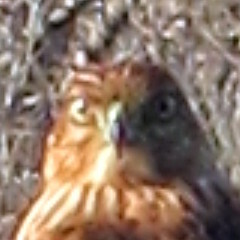 There were no squirrels around either... actually, given that intense stare, I didn't want to go out there either! After a full and active life, my wonderful dad passed away at the end of August at the age of 86. 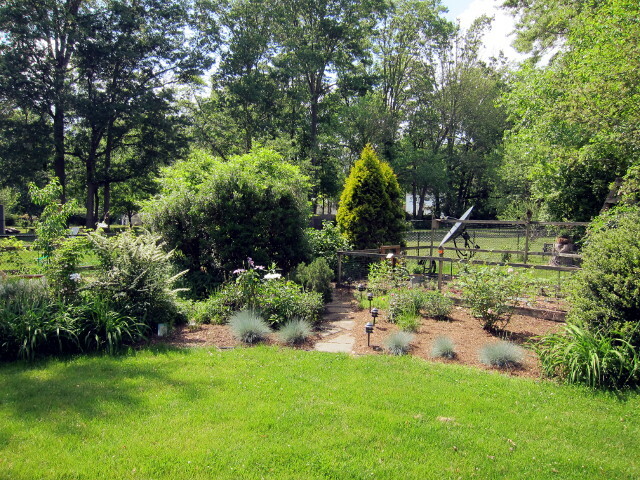 Both my parents played a strong role in my love for gardening and the great outdoors. Whether we were planting beds around their house, taking a drive to the Southtowns to see the Fall colors, or embarking on a family camping trip, we were never far from nature. Even into last Summer, you could still find dad outside tending the garden or mowing the lawn with mom. 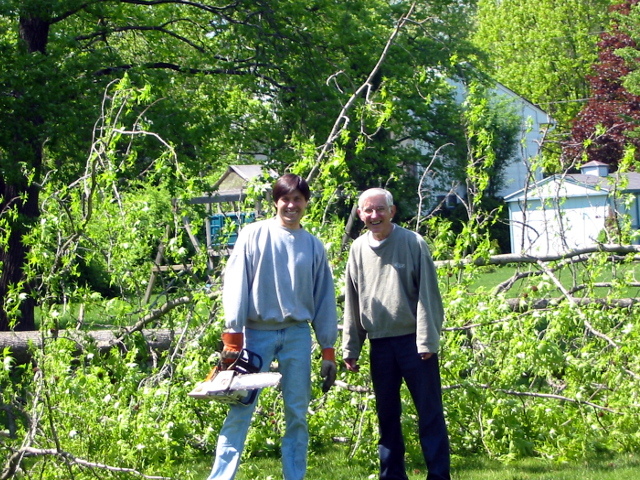 Dad also helped with projects at our house, including landscaping the pond and felling the occasional tree. The photo above was taken by my son Erik a few years ago after doing the latter.